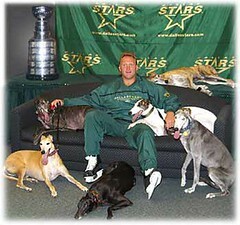 Greyhound Adoption League of Texas, as an official charity of the Dallas STARS Hockey Team, is proud to have Craig Ludwig, the STARS Community Liaison/Alumni Director, as Honorary Chairman and a spokesperson for GALT's greyhounds to raise funds for and awareness of greyhound adoption. GREYTEST thanks to the Dallas STARS for supporting GALT with the donation of 100 Platinum level tickets to see the STARS beat the Vancouver Canucks on November 6. It was an exciting game at the American Airlines Center and a sell-out for GALT! Many thanks also to those of you who purchased game and American Airline raffle tickets. GALT sold American Airlines Raffle Tickets at the Dallas STARS / Vancouver Canucks game on November 6 at the American Airlines Arena. Greytest thanks to the STARS for not only supporting GALT in the selling of these raffle tickets, but also for the generous donation of 100 Platinum level game tickets which was used as a fundraiser....and was a sell out! Many thanks to those folks who purchased the game tickets and raffle tickets as well. Volunteers David Cole, Michelle Scarlett, Heather Ranker Clark, John McQuade, Buffy Milner, Nancy Colwell and Susie McQuade along with Bob and Katie Bonnet worked the crowd and sold over 200 raffle tickets along with spreading the word of greyhounds as companion pets.